Yesterday, as I was knocking out my third life in candy crush (anyone else a candy crush addict), and realization came to me. I hadn't yet taken time to be quiet. I had not taken time to sit and read the scriptures. Does that ever happen to you? You're going about your day....doing one thing or another.....and then you realize that you've put so many others things before that precious quiet time with the Lord. That is what happened to me yesterday. I turned off my game and pulled up the scriptures on my tablet. I didn't have a whole lot of direction for what I was going to read. When this happens I go to my old standby, which is to pick a Psalms for whatever day it is. Well yesterday was the 1st. As I read Psalms 1, I was struck by verses 1 and 2. 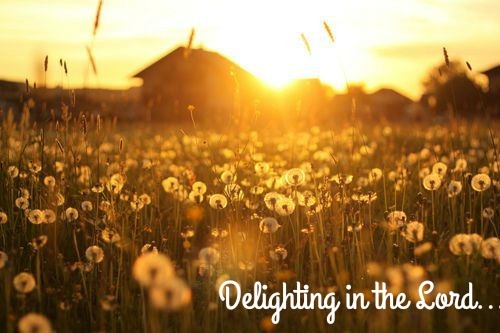 Do you delight in the law of the Lord? Do you find joy in it both day and night? I spent a few minutes, sitting in my room, asking myself those questions. I have a testimony of Christ and of my Father in Heaven. I try to hold a prayer in my heart, but do I truly find joy in following God and his commandments? Do I find the beauty in those simple acts everyday that allow me to grow closer with Him? Do I take time to pray and ponder the things that I read? Do I spend too much time on the things I want to do and not enough time on the things the Lord wants me to do? I love moments like these, when God is able to halt my momentum and make me stop to think...stop to think about where I'm at, where I'm going, and how I'm getting there. He has now given my scripture study more direction...more focus on what I need to be learning about. I'm trying to find more joy and love in God's leadership. I am trying to find more happiness in allowing Him to steer my life and to bring me to where I need to be. He is the greatest captain and will NEVER led us astray. What comfort that brings to me! I pray this day and all the days that follow I can put aside the things of this world and focus on the things of eternity. It is a daily struggle. One I think I will always be working on...I am only human after all :) Thankfully though, God knows we are imperfect and each day we are able to grow closer...grow stronger...reach closer to the potential God sees in us. What a sweet blessing that is! I gotta have my time with God before anything else, or it is way too easy for it to never happen at all. And since I can hardly make it through the day WITH studying the word, me without it is much scarier! The verses you quoted were actually my memory verses a week ago. Although I fail so often, I love the Lord and His law and do delight in it. Just wanted to tell you I enjoyed this post. It is kind of sad to see comments on all the other posts, yet not one pointing us to God. I would be interested to hear more about your faith. I am not a mormon, and my husband used to be, and my best friend is...although not very involved. I am a christian, and what I have seen you write about Jesus in the past has you sounding more Christian than mormon. I do not mean to offend by that, I just know that Christians and mormons believe differently about many things, and although the words are the same, the definitions are not. However, I read a post you wrote about Jesus being your Savior and so I have been wondering. I dont recall the post title, I can search it if you want.